Please forgive me if this is an old or otherwise dissalowed topic (move or delete as necessary), but I've been watching these for years and always found them incredibly fascinating. 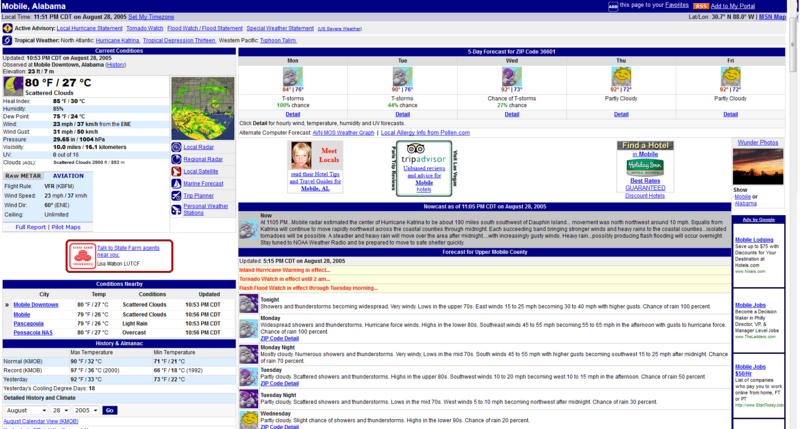 IntelliSTAR local forecasts from Gulfport, MS during the approach of Hurricane Katrina. Re: Hurricane Katrina local forecast. Not at all, its quite on topic for this sub board too. I grew up in West Monroe, LA. I really wish I'd thought to record some of the LOT8s from my area during various storms, like Katrina or Lili, which struck Monroe directly as a minimal tropical storm in 2002. We had a VCR, as much as I glued myself to the coverage, it certainly would have made sense! Self-bump and double post, but topic-relevant? On the 13th anniversary of Hurricane Charley's landfall, here's a YouTube clip I found of various WeatherSTAR XL radar loops from Orlando, FL, cut together to make one big radar loop of its approach, landfall, and passage inland. My ex-wife called me from Slidell at 5:30 that morning, asking for an update on Katrina because she lost power. I told her what I knew, then I called her crazy as hell for staying. She told me that if she had try to leave, she would have stuck on I-55 somewhere out of gas. My then-6-year-old son (living with me) was worried sick about her all day. Our phone call died because she lost her cell phone tower. She made it to her dad's house 2 days later. By then, many stories had come out about people running out of gas on I-55 during the storm. The ex-wife was actually right about something for once. I'm a big Weather Channel geek. This was my first day of fifth grade. I still had the WeatherSTAR 4000 all the way until 2010 because my cable company at the time was just so low-budget. 2010 was when we switched to Verizon FiOS and got the IntelliSTAR. This is unrelated, but I really miss those old Weather Underground icons. They always really charmed me for some reason. My cable company where I'm originally from (West Monroe, LA) was pretty up-to-date. We definitely would have been to the WSXL by the time Lili passed over in 2002, and we had the IntelliSTAR by 2005, if not by 2004.